Spring has finally made it. It's a good time to plant sculptures. In the patio, landscape or garden, Art will grow with the flowers, vegetables and trees and begin to achieve a more natural lifespan and life. Freed from climate controlled interiors, objects wear like you or I. The changing light and weather will add dimension and character to the form. With a natural backdrop of unpainted color, birdsong and wind, understanding of the work can suddenly shift from aesthetics to personal adaptive presence, defining the mutual space in private ways a Gallery or Museum cannot design. The above video is an illustration of an Antony Gormley sculpture installation. It's made of cast iron, and weighs about 2,000 lbs. Three stainless steel metric pins extend from the feet of the sculpture to beneath the limestone patio paver glued into holes drilled through a re-enforced concrete footer. Because the sculpture was to be installed against a wall, we had to cantilever the i-beam of the gantry and rig a counterweight of stacked palleted stones to prevent the gantry from tipping. This sculpture is made to rust. As it ages, the stains will leave it's mark on the floor and a brown trail will flow where the water goes, expanding continuously the Art's physical reach. It's been a difficult winter, back to back snowstorms without a break from the bitter cold have kept 3' of snow on the landscape and it's just now melting. In the evening half light the white surface glistens as if it were polished marble. 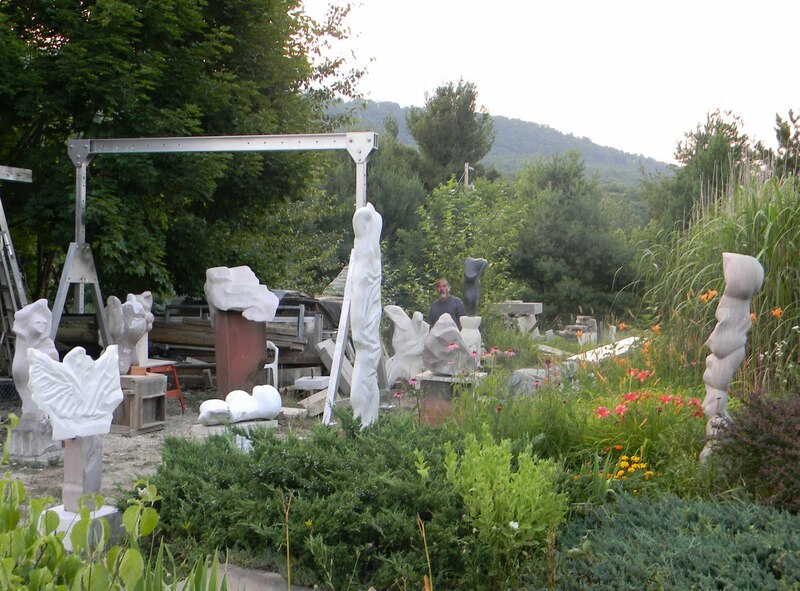 I love thinking I live in a great stone quarry garden. The snow piles softened by wind blast resemble modern sculpture and sometimes I recognize forms I've moved, made or imagined. The great Artist Louise Bourgeois has created a body of work in a variety of materials including marbles of different colors, especially beautiful white stones. This past year I have been involved in two projects installing several of these sculptures: an exhibition at the Hirshhorn Museum and Sculpture Garden and another for a private collector in Washington DC. These pieces were carved from blocks and left intact as if they had just been cut and lifted from the quarry. You can see the chisel and tooling marks left on the sides of the stone. Her polished forms escape from the top. 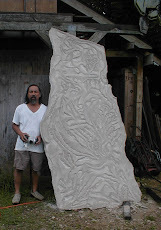 In DC, as part of a larger project, a private collector asked if I could de-install, help transport and re-install 2 stone sculptures from their old to new house. The heaviest piece was about 3000 lbs. It was a busy production, we packed them on pallets, loaded the pallets into an air ride box truck, delivered same day to the new residence where we transferred the load onto a small crane truck, which rigged the the pallets to the back porch and our access door to the inside space. The next day we installed them. In the morning when we returned to work on their other pieces, I met the client who asked that they be moved. " The sculpture didn't feel right where they were in the new space." I smiled and said of course I could. When the Art speaks, I try to respond. *video music excerpt: " Just Us Too." Mack on bass, Ben Gage on guitar.